You probably know Daphne Oz as a co-host from ABC’s clever food-based talk show, The Chew. So you already probably know how awesome her recipes are, and that she frequently puts a new spin on old favorites. She frequently makes vegetarian and vegan-friendly meals, which I always appreciate. In her new book, Relish: An Adventure In Food, Style, and Everyday Fun, Daphne fuses all of our favorite topics — and teaches us how to relish our foods and the fun events that center around our creations! Relish definitely isn’t a “cookbook” — it actually had a lot fewer recipes than I was anticipating — as the book gives more advice and party-planning suggestions than concrete instructions. That’s kind of the point. But the recipes that are featured in the book are definitely mouth-watering. As a vegetarian always on the quest for creative new ways to doctor up my go-to favorites, I really appreciated the way that Daphne presented her recipes — like an easy adaptation of vegan caesar salad dressing — and I really wish there were more. But this isn’t your standard recipe book at all. Sections of the book include how to be a fun and gracious host, and how to make mealtime part of your family’s hectic routine — also themes that round out segments on The Chew. She explains that it’s important to “be a guest at your own party,” and really enjoy the events you’re putting together. After all, how fun could your party or meal be if you spend hours fussing over details and never get to enjoy your company or culinary creations? Food really brings people together, that’s why we celebrate, meet up, and spend family time around the dinner table. Rather than focusing on making perfect meals, Daphne uses this book to encourage us to “enjoy the ride” — making memories (centered around food, entertaining, or family time) is an even more important part of the process. While offering inspiration for recipes in this book, Daphne’s not giving us rules to follow in constructing perfect food masterpieces. 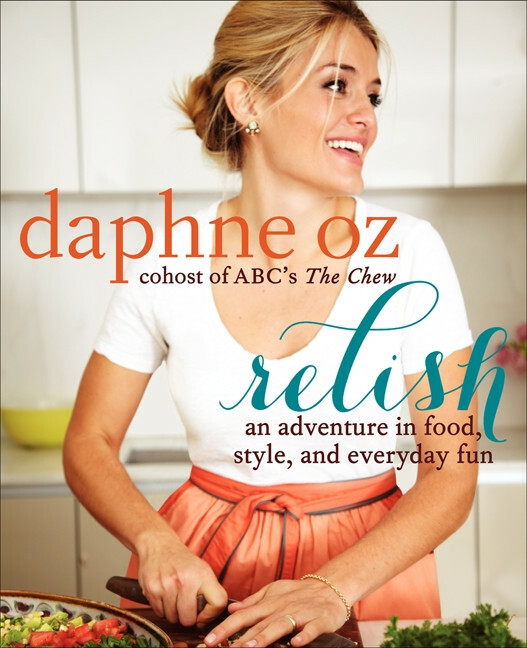 If you’re a fan of Daphne, make sure to check out Relish! Her bubbly style comes across in her writing the same way it does on TV, so you won’t be disappointed!